facebook Archives - … catching light in motion! One of the mistakes I’ve made in my career is to rely exclusively on my images to get me booked. That may have worked in the past, but as I get ready to push my business this fall, I know my clients want to see more than just pretty photographs. I’ve quoted this before, but it’s so valuable I’ll mention it again–Heather Elder* (@heathereldersf) creator of Notes From a Rep’s Journal said “The bottom line is that relying solely on your imagery to speak for you has become dangerous. Adding your voice to that imagery is as dangerous, but for everyone else, not you.” That sounds great, but how on earth do I add my voice to an image? Clients – at least the ones in the B2B space that I’m working with – are looking for more than just an image: they want a photographer who has a strong Social Media presence, one who understands how small businesses market themselves online, one who is recommended by his/her clients and who takes them behind the scenes of productions he’s worked on. On top of all that they expect award-winning photography and video productions. The target of your campaign is your website. Everything should bring your client to a homepage that proves to a potential customer one thing only: you are capable of producing the job for them. And how they can contact you (check out how to automate that first customer contact). OK, so that’s two things, but you know what I mean. 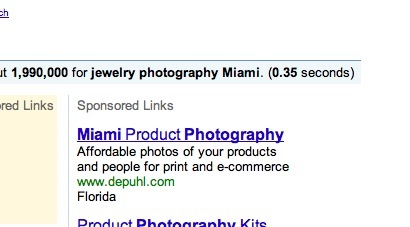 Does the first image your visitor sees on your site tie into your marketing? Yes – physical good old-fashioned postcards. With all the emails, Facebook messages, PMs, videos, texts and SMS’s we get today it’s easy to drown in a sea of electronic messages. Old-school post card connected to the cloud. How do you compete against this onslaught? Go old school (with a twist): send a handwritten postcard. Clients appreciate knowing that they weren’t part of an automated campaign, filled in with their <FIRST NAME> <LAST NAME> and thanking them for the opportunity to bid on a photography job for <THEIR COMPANY>. A handwritten than gets noticed. So where’s the twist I mentioned earlier? Well on the back of the postcard is a link that goes to a landing page with the same image, a client testimonial video and a contact form that integrates with my CRM along with all the automation that comes with it. This page continues into a blog series about this shoot, that details how I estimated the job, pre-produced and scouted the job and how the job actually got photographed. (For a more detailed explanation of how the physical postcard gets integrated with my cloud-based CRM, check out this weeks #MarketingHack #17: Link your postcards to the cloud! How broad can you go? The sky is really the limit on how far you want to take it – social media memes, customer video testimonials, organic Facebook campaigns, winning photo contests, behind the scenes videos, online recommendations on LinkedIn, periscope live broadcasts… All these pieces of content make up the voice you need to promote your small business today. How many more channels can you think of that this image could be integrated into? I’m trying to hit a narrow audience in the broadest possible way. content on the blog); the LinkedIn recommendation causes someone to check out your profile and leads to another visitor to your website… You don’t have to create a linear campaign, where step 2 follows step 1. Someone can enter this integrated marketing campaign at any point and go to almost any other channel to get more info. As I’m getting ready to come out of the slower summer months and gearing up for a busy fall, a marketing campaign like this can drive the visibility I’m looking for and ensure that new (and repeat) clients are hearing the voice I’m adding to my imagery.